Cyborg discovers an imminent threat in the depths of the oceans so powerful that it rallies together the newly formed Justice League. Meanwhile, wandering thousands of feet above the ocean floor is drifter Arthur Curry, a man with strange powers who may be the last chance to bridge the ancient Atlantean world with our own. Superman, Batman, Wonder Woman and the rest of the Justice League must band together as they face off against the warmongering Atlantean Orm, an army of sea creatures, otherworldly weapons and perilous odds. In this all-new epic adventure from the DC Universe, mankind’s only hope of escaping from the darkness lies with the guiding light of a man – Aquaman! Justice League: Throne of Atlantis - "Is That Metropolis?" Batman, Shazam and the Flash realize a difficult truth in this new clip from Justice League: Throne of Atlantis. justice league: throne of atlantis, Aquaman, Batman, Flash, shazam, Justice League, Throne of Atlantis, DC Comics, warner bros.
Justice League: Throne of Atlantis - "This is War"
Aquaman's half-brother Orm (Sam Witwer) vows war against the surface world in this new clip from Justice League: Throne of Atlantis. Aquaman, Ocean Master, Orm, Justice League, justice league: throne of atlantis, Throne of Atlantis, DC Comics, animated movie, warner bros. There are two types of people in the world: Those that are big Aquaman fans… and those that will be. 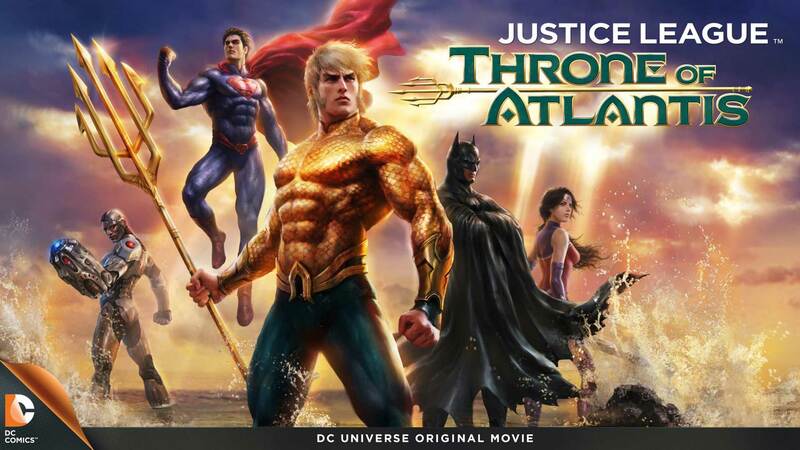 justice league: throne of atlantis, Throne of Atlantis, Aquaman, Justice League, mera, five things, DC Comics, warner bros.
Justice League: Throne of Atlantis - "Suggest Retreat"
Cyborg's undersea investigation turns deadly in this new clip from Justice League: Throne of Atlantis. justice league: throne of atlantis, Justice League, cyborg, Aquaman, clip, shemar moore, DC Comics, warner bros.